This lecture examines the role and meanings of the word vocation in Milton’s life-long meditation on (and concern for) what it means to be chosen by God. Milton’s profound anxiety in the years following his graduation from Cambridge regarding his poetic career and, more specifically, his status as a Christian poet selected by God for greatness is outlined. The topic is traced through Milton’s polemical treatise The Reason of Church Government, the poem Ad Patrem, and the author’s correspondence. Particular emphasis is placed on Milton’s interpretations of the parable of the talents and the parable of the workers in the vineyard. Substantial context on the nature of election and salvation is supplied from the writings of John Calvin and Max Weber. Professor John Rogers: We’ve looked at Milton’s earliest poem, or what Milton wants us to think of as his earliest poem, from a couple of different perspectives. So you remember our examination on Monday of the Nativity Ode, which I took to be an early poetic achievement in Milton’s career, and which Milton himself took to be an early poetic achievement in his career; but we also looked at the Nativity Ode as a poem or a kind of statement about the very nature of an early poetic achievement, and about Milton’s sense of the nature of a poetic career in general. And I think this can be said: this is true of a number of Milton’s earliest lyrics. The early poems are not merely brilliant literary exercises in and of themselves, although of course they are that. The early lyrics are also instances, moments, in Milton’s life-long meditation on what it is to be a poet. And I think it’s fair to say that Milton’s reconceptualization of the role of the poet permanently altered the way in which later generations, especially later generations of writers and poets, would imagine the work of poetry and imagine the power of the poet. In this respect Milton’s contribution to the Western literary imagination is really unparalleled. It’s this drive to constant self-definition that becomes the characteristic feature of Milton’s work for later generations. The Romantic poets like Blake and Wordsworth and Shelley and Keats in the nineteenth century are continually looking back to just those moments in Milton, Milton’s method of self-justification and surprising self-assertion, because it was precisely in Milton’s exercises in autobiographical writing that a crucial element of literary practice gets established: and that’s the element of the poet’s meditation on the meaning of his vocation as a poet. Milton is magnificently free of the pressures of modesty and reticence. And that freedom, the liberation from that burden, also becomes an enormous part of his appeal for later generations of writers. It’s just a fact that Milton is shockingly unembarrassed about making public all of his highest literary ambitions. There’s every indication that Milton believed, as I had mentioned before, at an unconscionably early age, that poetry was his vocation. And he’s continually willing to make that belief a public one. By “vocation” I’m not merely thinking of a job, although certainly the modern sense of vocation as a form of employment is certainly one that’s available to Milton and certainly present in his thinking about the vocation; but I also mean vocation in its earlier, more etymologically pure sense, the literal sense of the word: vocation as a calling, from the Latin vocare. One’s vocation is that to which one has been called – called presumably by God – to perform. So you have two rather competing senses of the word “vocation” here, vocation as employment and vocation as a calling, and they’re constantly for Milton bleeding into one another, these two senses of the word, and often struggling with one another or competing with one another. Milton was always wrestling with the problem of vocation in all of its meanings, and the problem of what a calling actually is and how one actually knows one has a calling is a problem that pulsates somewhere beneath most of the lines of poetry that Milton writes. …I began thus far to assent both to them and divers of my friends here at home, and not less to an inward prompting which now grew daily upon me, [and think about this inward prompting: is it the self’s own prompting or is this a prompting experienced internally, a prompting of God, a vocation?] that by labor and intent study (which I take to be my portion in this life) joined with the strong propensity of nature, [I agreed with all of these voices that] I might perhaps leave something so written to aftertimes, as they should not willingly let it die. Now it’s clear here that Milton is imagining this future work, the work that “aftertimes will not willingly let die,” as the fulfillment of a professional career. We certainly don’t here have an image of a poet whose poetry is being written effortlessly or easily as the young Milton seems convinced that Shakespeare’s poetry had been written. In L’Allegro and in Il Penseroso, which you’ll be reading soon–or especially in L’Allegro, Milton is able to say that Shakespeare simply “warble[d] his… Wood-notes wild.” He was able to produce all those magnificent plays simply by instinct: a kind of natural urge produced and generated all of that poetry. But Milton portrays himself as a laborer here, a poet who by labor and intense study actually has to work to produce the great poem. Milton’s divine vocation, his calling, seems in this light to be something like a vocation in the modern sense: it’s a job that exacts work or labor. Out of nowhere you get this sense of anger on Milton’s part and this kind of contempt that he feels and he will feel for the rest of his life: his contempt of his poetic competitors, his contemporary poets – all of whom are vulgarians in this characterization. …nor to be obtained by the invocation of Dame Memory and her Siren daughters, [these are all forms of poetic inspiration that Milton is declaring he is rejecting here – Milton’s work, the great work will emerge instead from] …devout prayer to that eternal spirit who can enrich with all utterance and knowledge, and sends out his seraphim with the hallowed fire of his altar, to touch and purify the lips of whom he pleases. It’s an amazing passage. You have at the end of this sentence that same – and you’ll remember this – that same image of prophetic preparation with which Milton had begun the Nativity Ode, but you’ll remember that line, “from out his secret Altar touched with hallow’d fire.” Like the old Hebrew prophet Isaiah, Milton will be inspired to write his great work when the iniquity of his lips is purged, when the eternal spirit touches with hallowed fire the lips of whom he pleases. Milton is going to be a great poet because it has pleased God to have chosen him, because God has called Milton to serve as a human conduit for the conveyance of divine knowledge; and so according to this concluding image here of this sentence, Milton’s imagining himself more or less in the traditional image of the great biblical prophets, the passive vehicle through which the Deity transmits His awe-inspiring message. But this pious subservience that you have ending this passage – and certainly it’s consonant with that image from the Nativity Ode – nonetheless, I think it’s safe to say that it comes as quite a shock when you consider the sentence as a whole. Milton had begun the sentence not with calm, prophetic certainty about his divine vocation. He began it with a far more secular set of images, a set of images that comes from the world of business. It’s a set of images that couldn’t be more foreign or more alien to the prophetic mode of the Old Testament prophets. Milton begins by saying that he was going to write a great work because he’s “indebted,” because he owes the English people something after all of their patient waiting: “[Nor] do I think it shame to covenant with any knowing reader, that for some few years yet I may go on trust with him toward the payment of what I am now indebted.” And according to this image of the vocation of the poet, Milton isn’t claiming divine inspiration at all. He’s making a deal. So think about this sentence with its combination of commercial rhetoric and prophetic language, making explicit the competing models really for the production of the great poem. So the first model is that the poem will be the result of the poet’s labor, his hard work, the expense of which will be assumed by the reader’s credit. That’s the secular, the economic image. And the second model is that the poem will be the consequence of the poet’s humble prayers to the eternal spirit, a spirit who doesn’t inspire the poet who works the hardest but simply the poet whom it pleases the spirit to inspire. And so in the sentence that we’ve just looked at at some length now we have embodied in the form of a shifting argument – a really slippery argument – the two senses of the word vocation: vocation as a job and vocation as a divine calling. And I’d go so far to say that most of the really, truly memorable moments in Milton’s poetry and prose have been generated by some version of just this conflict. Milton’s poetry is always emerging from the gap between the competing meanings of a particularly important and weighty concept like that of vocation. Now to some extent we shouldn’t find ourselves surprised that we see at the heart of Milton’s statement anticipating his future greatness something of a contradiction concerning the idea of a vocation. It’s just this uncertain status of a whole raft of ideas associated with vocation that really fissured and fractured the spiritual lives of countless seventeenth-century puritans. Milton is inheriting here an enormously rich tradition of thought on this subject. According to the sixteenth-century Protestant theologian Jean Calvin – a Swiss theologian, or actually French but he lives in Geneva – God chooses us, God elects us for salvation and damnation. We ourselves, of course, have no choice whatsoever in the matter. And this belief that’s called Calvinist predestination is really at the heart of mainstream English Puritanism at this point. Our salvation is entirely in God’s hands. But it seemed to a lot of followers of Calvin that it was a matter – and you can imagine why – it was a matter of some urgency and a matter of some importance to know whether one had actually been elected by God for salvation. We need some proof of our salvation simply to get up in the morning actually, when you think about it, and the only proof for so many of Milton’s contemporaries seemed to lay in the degree of visible success that they seemed to have enjoyed. And so then, much as now, one of the most obvious signs of success was, of course, financial. 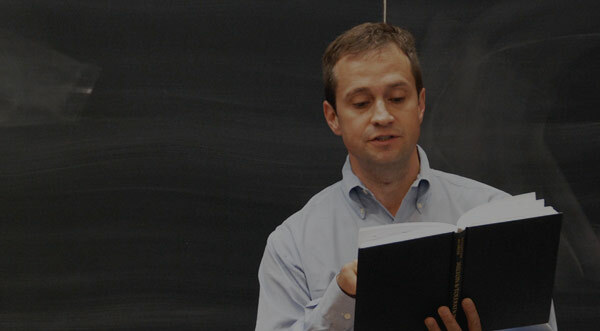 The means by which we could discern whether God had called on us to join the elect was by discerning the profitability of our vocation – vocation in the secular sense of employment – and so you can probably see something like the strangely perverse logic that could begin to attach itself to the puritan belief in God’s predestination of all human beings either to salvation or damnation. It’s generally understood that this is not at all what Calvin had intended, but it’s what happened nonetheless: one felt that one had to prove to others, and maybe more importantly to prove to oneself, that one has already been predestined by God. For salvation one has to be successful, and the only way to assure one’s success is to labor, of course: to work hard, to achieve through effort that success which one secretly feared should already have been achieved by means of predestination.There’s an irrational inversion of cause and effect here, and it’s a magnificent paradox: God chooses us based on no work of our own, but we find ourselves working as hard as we possibly can in order to demonstrate to ourselves that we have, in fact, already been chosen. According to the German sociologist Max Weber – the founder of the discipline of sociology who pioneers the study of the sociological impact of Protestant theology at the beginning of the twentieth century – it is precisely this backwards and cruel logic that’s responsible for what he – and it’s an enormous claim, essentially insupportable, but it’s this backwards, crazily inverted logic that’s responsible for the economic progress of the northern Europeans – for what Weber calls the emergence of the “Protestant work ethic.” So historians can and in fact have many times taken issue with a lot of Weber’s historical claims. But he’s invaluable, as the critic John Guillory has argued, for our purposes in the understanding of Milton and of a lot of the cultural business of the seventeenth century in general. The assumption among a lot of reformation Protestants in Milton’s day was that what God commands above all else is our labor, our investment, and God expects after our labor and investment that we have something to show for it at the end – it makes sense - that we have in some way profited. And so it’s here at this intensely awkward point at which Protestantism and capitalism, two seemingly disparate spheres of activity and thought and being – at this strange point at which these two things converge – it’s at this intersection that we find John Milton. To understand the concerns of Milton’s poetry, it is important to understand this massive conjunction of economic and spiritual thought that’s really at the heart of English Protestantism. But that’s just a part of the story. There’s also a more specific, a more local, reason for which our John Milton was susceptible to this profit-and-loss rhetoric of Calvinist puritan theology. Milton was the son of a banker. (Technically, banks didn’t exist at this point in the seventeenth century. It’s not until the Dutch invent banks late in the seventeenth century.) Milton is the son of what is the equivalent of a modern-day banker. He’s what would have been called in the seventeenth century a scrivener or a goldsmith. A goldsmith was an early money lender, and it was a perfectly respectable profession as far as bourgeois professions go, and John Milton, Sr. has a pretty good living. But in practice it’s actually much more analogous to what a modern-day pawnbroker does: you would leave with John Milton, Sr., the goldsmith, a portion of gold and on the basis of that collateral – this is all the business of collateral loans, pawnbroking – on the basis of that collateral, John Milton, Sr. would lend you a sum of money for which you would pay him interest. At the end of the loan upon your payment of the principal and of sufficient additional interest, John Milton, Sr., the goldsmith, would return to you the gold that you had entrusted to him. Now Mr. Milton took some risks when he separated himself from his cash and lent money to his clients, or lent more money to his clients than the collateral, the gold, was actually worth. And the motive for that risk, of course, the motive for that investment, was the expectation of a profit. It’s just this economic pattern of risky investment and the expectation of a profit that forms something like the thematic paradigm of profit and loss that really is at the heart of Milton’s representation of his future literary greatness, his conception of himself as a poet. Milton seems to have inherited from his father a language of commerce, a language that he was able so easily and effortlessly to transpose from his father’s vocation as a goldsmith to his own anticipated vocation as a poet. I’m going to ask you to imagine the domestic situation in the Milton household in 1632. Milton has just returned home after seven years at the university, a university education so generously financed by his father who was actually now 70 years old, and John Milton, Jr. was just turning twenty-four. Twenty-four is the canonical age at which young men were received for admission into the priesthood. It’s like joining the army at eighteen; at twenty-four, that’s what you do if you have an MA from Cambridge. You enter the Anglican priesthood. And a twenty-four-year-old Milton, after seven years of education, simply decides not to go. Instead of joining the ministry, Milton instead returns home and he stays at home without any means of supporting himself for six years. So with the financial support of his father Milton stays at home and reads. He studies. And it’s in these years after his graduation from college that Milton embarks upon what is essentially a systematic study of all available knowledge. He commands a mastery of just about the entire canon of Western literary and historical learning. He prepares himself for what his father is still imagining will be the priesthood but for what Milton is probably imagining will be his future career as a great English poet. …you have an account of my means, and whatever [and now we’re on page eighty-three] wealth I possess I have reckoned up on this paper, for I have nothing except what golden Clio has given and what has been the fruit of the dreams in a remote cavern and of the laurel groves of the sacred wood and of the shadows of Parnassus. And you, my juvenile verses and amusements, if only you dare hope for immortality and a life and a glimpse of the light beyond your master’s funeral pyre, and if dark oblivion does not sweep you down into the throngs of Hades, perhaps you will preserve this eulogy and the name of the father whom my song honors as an example to remote ages. Milton’s essentially making a covenant. This is a contract with his father in this passage. He’s engaging his father in to a contractual situation just as he will engage the entire English people (as we’ve already seen) in The Reason of Church Government. If his father continues to support him – this is the magnificent logic here – if the father continues to support him, he will repay his father with his own future fame, a name that his fellow Englishmen will not willingly let die. Milton’s fame will preserve his father’s name; and of course, it has throughout the ages. Needless to say, the satisfaction of John Milton, Sr. will have to be postponed to the great hereafter. He will not be able to reap the profit of his investment in his son’s study until not only after his own death, but of course after his son’s death as well. That’s Milton’s logic here. But then who would understand better than John Milton, Sr. the importance or the value of a long-term investment strategy? There’s a tone of self-assuredness and a confidence and certainty in this poem that, I have to say, isn’t always matched in the other works that Milton’s writing in this same period. In most of the other writings that you have looked at for today, the weird Calvinist logic surrounding the idea of divine predestination makes it impossible for Milton to be that comfortable or that confident about the idea of a true poetic vocation. How can Milton know that he was really and truly called by God to be a great poet until he writes something – it’s not a bad question – until he has something actually to show for his talent? And how can Milton have anything to show for his talent until he has – this is the logic – until he has patiently waited for God to inspire him to write? He can’t know until he’s been inspired to write, and he can’t of course start writing until he’s been inspired – it’s a peculiar but familiar double bind. It’s a puzzle that proved infinitely anxiety-producing for the young Milton, and it’s really the productive engine that keeps this extremely anxious poet going in the early years. Those passages of the Bible that seem to have been particularly useful for this dilemma were two parables from the New Testament, and those are represented in the [course] packet: the parable of the talents and the parable of the workers in the vineyard. You will soon be seeing innumerable ways in which these parables continue to creep up in Milton’s verse. The language – we could also think of it as the ideology – of these parables is constantly surfacing in Milton and provides something like a divinely authorized focal point for what I had mentioned earlier: this strange intersection of spirituality and economics. I know it’s a little difficult to read, but I included nonetheless in the packet the Geneva Bible (that’s the great sixteenth-century Calvinist Bible) – that version of these two parables written before the King James because it provides all of those glosses, those marginal annotations on the side, those incredibly mean-spirited and dark Calvinist interpretations of the Bible. I’m convinced that those glosses, those annotations, drove Milton absolutely mad and so much of his own rewriting of the Bible essentially in Paradise Lost is a response to a lot of the annotations of the Bible that he grew up reading. So the first parable that we have to look at is the one that without question instilled the most anxiety in Milton, and that’s the parable of the talents from Matthew 25. So this is the parable of the talents. A master distributes his wealth to his servants and the wealth is distributed in the form of a coin, and the name of the coin is translated in English with the word talent. It’s precisely the word here for this coin that gives us our modern word, our modern word talent, which means “a skill,” of course or “a predisposition.” Now think about it. That our word talent has its origin in this parable should give you a sense of the extraordinary cultural weight that this parable has assumed. I knew thou was’t an hard man which reapest where thou sowedst not and gatherest where thou strawest not. I was therefore afraid and I went and hid thy talent in the earth. Cast therefore that unprofitable servant into utter darkness. There shall be weeping and gnashing of teeth. The conclusion of this parable seems so violent perhaps because the lesson to be learned from the parable is so uncertain. Milton seems to have been drawn to the parable as a way of understanding the expectations placed upon him by his master – actually his two masters, or his two fathers. There is first the earthly father, John Milton, Sr., who had given Milton the talent of an expensive education and then six years of additional heavily subsidized study; and there is also the Heavenly Father, who had given Milton his rhetorical gifts and expected him to use them in some way for God’s benefit – presumably to use them in some way beneficial to the church (the most obvious way being naturally the vocation of the ministry). And the parable is a horrifying one because it places such an unspeakable pressure on the interpreter to produce something, to show something for himself at the end of the day. And for Milton, whose temperament up to this point inclined him obviously to hesitation, to postponement, and to merely the anticipation of profit, the pressure applied by this parable of the unprofitable servant may very well have seemed utterly unbearable. Now when asked by the hardest workers why “each of the laborers received every man a penny,” the householder replies, “Take that which is thine own and go thy way. I will give unto this last as much as to thee.” So in this parable, which has suggested to generations of readers something like socialism or a form of communism, the amount of labor actually expended is immaterial, so that the latecomer to the job is rewarded the same as the worker who was there from the very beginning and working from the very beginning. As a model of economic activity or as a kind of vocation guide, this parable couldn’t be more opposed – or to some wouldn’t seem more opposed – to the parable of the unprofitable servant. The men who stood around and did nothing until they were called to act earned precisely the same amount as those who had been laboring in the vineyard all day. They’re not punished for their unprofitable expectation. They’re not punished for just waiting around to be called to work. They’re not bidden to be cast out in to utter darkness where there’s weeping and gnashing of teeth. They’re rewarded for their waiting. This parable may seem, I think, to be a little more compatible with Milton’s general temperament in the years of his studious retirement. As a young man consumed with anxiety about his failure yet to do anything, whether to gain employment as a clergyman or to produce somehow some great work of literature – Milton’s continually seeking assurance that the latecomer (and this is how he’s thinking of himself) will be rewarded, that the latecomer will be actually able to produce something when he is called to produce something. For Milton these two parables were locked in a powerful dialectical relation to one another. The “parable of the talents” rewards hard work and investment; and it’s satisfying because it does that, but it also instills an anxiety about non-productivity. The “parable of the vineyard” assures us that God rewards us regardless of our hard work and investment, but only if we’re called, only if God chooses us. And so you can see the strange dialectic developing here: the anxiety aroused by one parable necessitates the consolation that’s offered by the other one, but the consoling parable soon arouses its own anxieties, which only can be quieted by recourse to the other parable. The result, needless to say, is mind-spinning. We’re all familiar with at least a version of this. All of us just as human beings, all of us want to be rewarded. We want to be loved for our hard work, and we’re all working really hard here. But of course, we also want to be loved – we want to be rewarded unconditionally without any contingencies whatsoever. On some level that’s just the human condition. And Milton uses the language of these two parables to get at this problem that has resonances in every conceivable sphere. Now shortly after Milton composed the sonnet “How soon hath Time,” he wrote a letter to a friend in which he enclosed this poem, the sonnet. This is in the packet after the parables. We don’t know the intended recipient of this letter, and we actually have no idea whether Milton actually sent the letter; but a couple of drafts of this letter actually exist in Milton’s own hand, and the letter is clearly a document that Milton had devoted some energy and some time to. We need to look at it. Nature herself pushes a young man to begin a family and to seek credible employment [Milton writes]. The natural desire for fame seated in the breast of every true scholar usually pushes him to make haste by the readiest way of publishing and divulging conceived merits. But it’s just this making haste toward publication – writing something really great right now – that Milton’s resisting here. He claims to be studying and learning rather than producing right now; and there’s a problem with just studying and learning, and it’s a problem that Milton can’t avoid. It’s possible that in merely reading and in merely amassing more and more knowledge, Milton’s doing little more than the unprofitable servant in Matthew 25. It’s possible that he’s hiding his talent or burying his conceived merits deep within the earth, and it’s this frightening possibility that Milton forces himself to engage head on – the implications of this parable. …does not press forward as soon as may be to undergo but keeps off with the sacred reverence and religious advisement how best to undergo, not taking thought of being late so as to give advantage to be more fit. Unbelievable. You look at a passage like that in complete astonishment. Milton has invoked, of course to his own detriment – what was he thinking? – the parable of the unprofitable servant, the parable of the talents. But he invokes it to show that if one really reads it carefully enough, one can see that the lesson to be drawn has nothing whatsoever to do with the due and timely investment of one’s talent. What this parable really teaches us is that we do best to wait, we do best to consider the command, to consider all of the possible investment strategies. Maybe we want to go into the ministry, maybe we want to go into poetry. Perhaps we want to write like Shakespeare, maybe we want to be a writer like the great Old Testament prophet Isaiah. But the last thing we should be burdened with, Milton’s suggesting here, is the fear of being late. Now I don’t have to tell you that Milton has done a powerful violence to this parable in Matthew. Now God only knows what this parable actually means. It’s perfectly inscrutable as far as I’m concerned. But I think I can say with absolute certainty that one of its possible significances cannot be that the unprofitable servant should have waited to make his investment. Now think of it: if Milton had been the servant, he wouldn’t even have made it to the stage of burying the stupid coin in the earth. He would be consumed with the consideration of whether to bury it here or whether to bury it there – or should he bury it two feet under, or maybe he should bury it six feet under? Okay. I’m going to stop there. There’s a lot more to say about the parable of the talents and the parable of the laborers in the vineyard, but we have run out of time.